This cake has just a light banana flavor combined with fragrant vanilla. The banana helps add stability and moistness, so don’t leave it out to make a vanilla-only cake. It is such a subtle flavor that is most lovely, and the cake is fluffy and moist, perfect for any special occasion. Recipe reprinted from Let Them Eat Vegan* by Dreena Burton (Da Capo, © 2012), by permission. Photo by Hannah Kaminsky. Preheat the oven to 350°F. Lightly oil two 8-inch round cake pans and line the bottom of each with parchment paper, if you desire. In a large bowl, combine the flours, xanthan gum, and agar; sift in the baking powder and baking soda; then add the sugar and salt. Mix well. In another bowl, stir the nondairy milk and banana together, and then add the vinegar, extract, and oil. Add the wet mixture to the dry, and stir until incorporated. Pour the batter evenly into the prepared pans. Bake for 27 to 30 minutes, or until a toothpick inserted in the center of each comes out clean. Remove from the oven and let cool in the pans on a cooling rack. Use an immersion blender or mini processor to puree the banana. This cake takes a little longer to set up than some of my other cake recipes. Just have patience, and watch until the layers become lightly golden around the edges and the centers are no longer dull and sticky looking (and test with a toothpick)! Cupcake variation: To adapt this cake to cupcakes, line twenty to twenty-two compartments of a muffin tin and fill about halfway with the batter. Bake in a preheated 350°F oven for 22 to 24 minutes (test with a toothpick). Substitutions: You can use white rice flour, brown rice flour, or a combination of both. Note that white rice flour gives a slightly lighter cake texture, and brown rice flour can impart a subtle aftertaste. For taste and texture, using all or some of white rice flour is preferred. 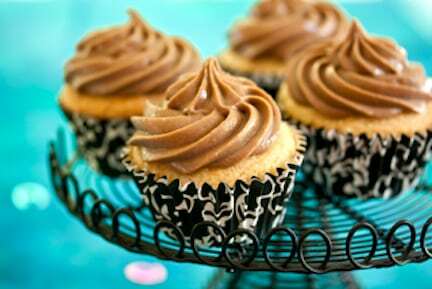 This chocolate frosting is an adaptation of the cooked vanilla frosting, and rivals my other chocolate frostings as my all-time favorite. Yep, I think it’s won me over! In a saucepan over medium heat, whisk the flour with the sugar, cocoa, salt, and agar. Gradually whisk in the milk. Cook, stirring frequently with a whisk at first, and then whisk almost constantly as the mixture thickens (take care that the mixture doesn’t thicken on the bottom of the pan and clump; lower the heat to medium-low, if necessary). Transfer to a stand mixer fitted with the paddle attachment. Mix on high speed for about 5 minutes, until the mixture has started to cool down. Add the coconut oil and beat for another few minutes, until the mixture is cool and creamy. At this point, you can either frost your cake or chill the frosting to whip up even fluffier. Frost the cake or refrigerate the whipped mixture. Note: When using millet flour, because it is gluten-free, it is helpful to use extra agar to help stabilize the frosting. bitter for their taste buds, add another 3 to 4 tablespoons of powdered sugar. When adding the powdered sugar, be sure to turn off the mixer, and work it in slowly and then up to high speed (so as not to get a sugar dusting yourself)! If you’re feeling energetic, whip up this chocolate frosting and also the Cooked Vanilla Frosting, for a “black and white” cake. Choose a vanilla or chocolate cake batter, and simply frost half of each layer with the vanilla and chocolate frostings. Like a “black and white cookie” in cake form! Cooked frosting traditionally uses all-purpose flour and butter. Coconut butter steps in for the dairy butter, and barley, spelt, or millet flour can be used in place of all-purpose. I like using millet flour. Because it is gluten free, it is easier to whisk and more forgiving, with less tendency to clump, than a gluten-based flour. A plain or vanilla almond milk can be substituted for chocolate. If so, you can add another 1 to 2 teaspoons of unsweetened cocoa powder to the whisking mixture. Dreena Burton is the author of Eat, Drink, and Be Vegan* and other books. For more of Dreena’s recipes, visit her blog.